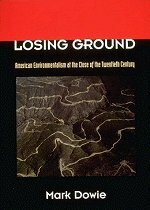 REVIEW - Losing Ground: American Environmentalism at the Close of the Twentieth Century by Mark Dowie. Rachel's Environment & Health News: #442 - The Right To Pollute. Losing Ground: American Environmentalism at the Close of the Twentieth Century by Mark Dowie. Dowie is an award-winning journalist with a penchant for radical inquiry. He has tackled the American environmental movement out of frustration, believing that it should have accomplished much more than it has. Why environmentalism has failed to live up to its potential occupies much of Dowie's rigorous analysis. He begins with a scathing history of the movement's first stirrings, an effort by well-heeled, elitist white men to maintain wilderness areas for recreational purposes. The next phase pitted conservationists interested in "wise use" against the more prescient preservationists. Dowie tracks the rapid devolution of "wise use" into abuse during the Reagan years and the foolish fallback tactics of the green movement, which bureaucratized itself into little more than a direct-mail machine. As critical as Dowie is, he does see hope in the next phase of this phoenixlike movement. He believes that a genuinely democratic form of environmentalism--linked to civil rights, focused on urban as well as rural environmental issues, and involving women and men of all races and cultures--is possible and promising. Let's hope so. Donna Seaman --This text refers to an out of print or unavailable edition of this title. A recent history replete with compromise and capitulation has pushed a once promising and effective political movement to the brink of irrelevance. So states Mark Dowie in this provocative critique of the mainstream American environmental movement. Dowie, the prolific award-winning journalist who broke the stories on the Dalkon Shield and on the Ford Pinto, delivers an insightful, informative, and often damning account of the movement many historians and social commentators at one time expected to be this century's most significant. He unveils the inside stories behind American environmentalism's undeniable triumphs and its quite unnecessary failures. Dowie weaves a spellbinding tale, from the movement's conservationist origins as a handful of rich white men's hunting and fishing clubs, through its evolution in the 1960s and 1970s into a powerful political force that forged landmark environmental legislation, enforced with aggressive litigation, to the strategy of "third wave" political accommodation during the Reagan and Bush years that led to the evisceration of many earlier triumphs, up to today, where the first stirrings of a rejuvenated, angry, multicultural, and decidedly impolite movement for environmental justice provides new hope for the future. Dowie takes a fresh look at the formation of the American environmental imagination and examines its historical imperatives: the inspirations of Thoreau, the initiatives of John Muir and Bob Marshall, the enormous impact of Rachel Carson, the new ground broken by Earth Day in 1970, and the societal antagonists created in response that climaxed with the election of Ronald Reagan. He details the subsequent move toward polite, ineffectual activism by the mainstream environmental groups, characterized by successful fundraising efforts and wide public acceptance, and also by new alliances with corporate philanthropists and government bureaucrats, increased degradation of environmental quality, and alienation of grassroots support. Dowie concludes with an inspirational description of a noncompromising "fourth wave" of American environmentalism, which he predicts will crest early in the next century. Losing Ground unveils the inside stories behind American environmentalism's undeniable triumphs and its quite unnecessary failures. Journalist Mark Dowie, who broke the stories on the Dalkon Shield and the Ford Pinto, delivers an insightful, informative, and often damning account of the movement many historians and social commentators at one time expected to be this century's most significant. Illustrations. Mark Dowie is currently editor at large of InterNation, a transnational feature syndicate based in New York. A former publisher and editor of Mother Jones magazine, he is the recipient of fourteen major journalism awards, including an unprecedented three National Magazine Awards. Perhaps the greatest weakness of individual environmentalists and the environmental "movement" is the absence of public self-examination. While political insiders may clearly see the difference between the National Wildlife Federation and the Sierra Club, the public has few resources to gauge them. Opening the doors is author Mark Dowie, a champion of local activism and the integration of environmental issues with other social movements. Tracing the origins and bureaucratization of the environmental movement, Dowie criticizes the most recent surge of co-option, the "third wave" or economics-based environmentalism. "Regulatory flexibility and 'constructive engagement' with industry have created some business heroes, but they can be counted on one hand," he writes. "The rest, unfortunately, need to be regulated." This is not to say this book is a rant against environmental business. There are no heroes or villains in this book, which makes it a rarity in the environmental lexicon. Instead, Dowie criticizes the corporate structure of environmental groups, and portrays each organization with their individual merits and flaws. Compromising Local Leadership Dowie reminds readers of the decision by the Natural Resources Defense Council and Cultural Survival to negotiate with the Ecuadorian government over oil drilling in the Yasuni Reserve. Arguing that oil drilling would be inevitable, and "[w]ithout consulting the Huaorani people or the appropriate Ecuadorian environmental organizations, [NRDC's] Scherr and Kennedy struck a deal: Conoco could drill on the Huaoroni reserve in return for a $10-million donation to an Ecuadorian foundation created by NRDC and Cultural Survival, an indigenous-rights groups based in Cambridge, Massachusetts." The NAFTA debate saw essentially the same argument made: free trade is inevitable, so environmentalists have to go along and get what they can. NAFTA's "It's a win-win-win situation" argument was accepted by various environmental groups. In the long run, the agreement and side provisions may indeed provide resources and rewards for cross-border environmental planning. But Dowie draws back to review the consequences of increased commerce. "It should be clear to any environmental thinker that free trade can only lead to the globalization of massive, consumer- based economies that are, in the long run, whatever the legislated safeguards, ecologically destructive. But mainstream environmental officials evidently don't think a lot about the distant future. Like the corporations they have come to resemble, they tend to be occupied with the day-to-day imperatives of strategy, competition and survival." From a parochial viewpoint, it would have been interesting had Dowie included a critique of the way in which many D.C. groups finally "discovered" environmental problems along the border and how most of these organizations lost interest in the border after NAFTA passed. It would also be interesting to document the criticism the mainstream groups made of those local groups that disagreed with them on the potential consequences of NAFTA. At the Center and Stumbling The problem with mainstream environmental groups stems from their decisions in the 1980s to focus energies on power plays in Washington, D.C., instead of reaching out to state and community organizations. Had the focus remained on "reaching out to state, local and regional organizations," he writes, "the American environmental movement today would be much stronger and more consequential than it is. An explosive critical mass of national activism could have been formed. Instead, a relatively harmless and effete new club appeared." Dowie suggests that the disproportionate ratio of funding (70 percent to 30 percent) between mainstream and grassroots groups remains an obstacle for community organization, suggesting that "a 20-point shift, of $200 million would change the complexity of the entire environmental community." The publication of Losing Ground offers readers an insightful view of relations among environmental groups, many of which demand transparency in government and business circles, but not among themselves or their colleagues. This is one of the most valuable guidebooks and is one of the year's must-reads.